The Mental Health Channel is here. Arcos Films offers 12 regular shows with 47 episodes currently filmed out of 120 that are planned. Each episode is about seven minutes in length, and is always available on the MHC website free to view, free to share and commercial free. Tune in now and you can eventually tell others that you were present at the creation. MHC seeks to provide “engaging, enlightening, informative programming, commercial free” to help everyone improve mental health. Stanford University is seeking people to participate in their Work & Stories project. 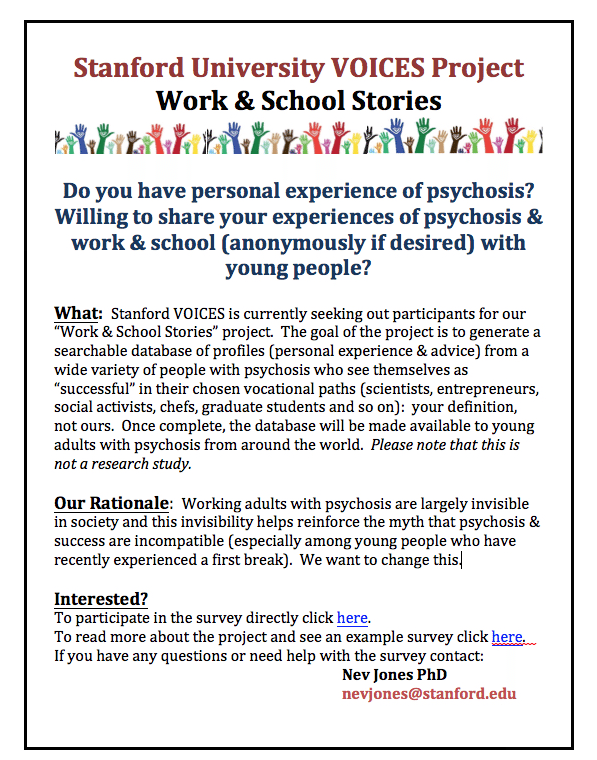 This project is designed to collect stories from a variety of people with psychosis who see themselves as successful in their chosen vocational paths. Linked to the right is a flyer with information about the project and the contact information for those leading it. 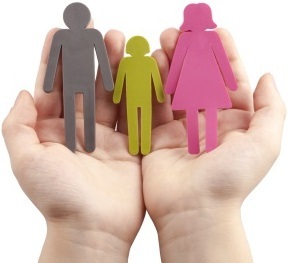 The project will help to highlight the success that individuals with psychosis achieve in life. Please share this information with individuals you may know who live with psychosis and might be interested in participating. Survey. A direct link to the project’s survey is available here. Website. Visit the project’s project website for additional information (including a sample completed survey). From the Article: 7 Things to Remember About Mental Health by Sandy Smith at the NAMI National Blog. Information and opportunities to get involved can also be found right here on NAMI’s website. You can learn. You can find out how to support yourself or a loved one. Or you can see how to get involved and make a difference in your community. I am so honored to have Rudy Caseres featured as a guest post on I Run This Mind this week. Rudy and connected via Instagram, a social media platform that has done wonders to bring together those who are diagnosed with mental illnesses and advocates around the world. Rudy’s support of my own endeavors has been nothing but encouraging. I am so happy to be able to return his support and share his words here. You can follow Rudy on Twitter and Instagram, and check out his website here. In recognition of PTSD Month and the National PTSD Awareness Day, Argosy University in coordination with Del Amo Behavioral Health Systems and Patriot Support Programs is conducting a Post-Traumatic Stress Disorder Seminar. C. Carl Wilson, LPC, CRADC is the Installation Director of Behavioral Health at the Marine Corp Logistical Base, Barstow, CA (MCLBB). He is a licensed psychotherapist in Missouri and Iowa. He has a license and certifications in Substance Abuse, Anger Management and Human Behavior. He served in the Army for 11 years before returning to social services. He has worked for several years with the Department of Veteran Affairs. He currently serves as a seminar and workshop presenter for Covenant Counseling, offering courses in Anger Management, Substance Abuse and Marriage Boot Camps around the country. His background includes private practice and inpatient treatment case management. Carl’s primary area of research has focused on the relationships between anxiety and hypertension. He is currently working on a doctor of behavioral health degree with a completion of December 2015. What is PTSD? | Impact of PTSD? | PTSD and the Military | How to jump start a career in Psychology, Counseling Psychology, Forensic Psychology or Criminal Justice and more…..
Save the date in your calendar and RSVP. More details will follow soon. Can social media cause Post Traumatic Stress Disorder?